I am writing this before going to a most beautiful garden in the hotel which is a huge former caravanserai to listen, in English, to those of famous Persian poets​. ​We flew to Shiriaz, a rather nondescript​ town with single storey buildings hidden behind shops bristling with merchandise or yellow brick walls. The vineyards that once produced its famous wine have long since gone, but gardens remain round the graves of poets and the ancients city of Darius – Persepolis do not disappoint. Its stands on a ridge on the edge of mountains, a vast site where one can imagine its grandeur through its sheer scale and the reliefs of ambassadors bearing gifts from every quarter of the then known world. We visited the tomb of Cyrus the Great and the remains of his palace overlooking a vast garden with pavilions. The royal pavilion where he received his visitors and the formal entry gate to the royal precincts have been excavated, but beyond them under sand and stones, lies the city. We drove to Yadz, the city of wind towers and more gardens. Already slightly cooler, but like most Iranian cities, it is still short of water which came, and still does, from aquifers through underground tunnels with inspection shafts every 40 metres. Isfahan has a river which only flows if there has been rain or a snowfall. Today everyone was picknicking along it. This is a city of magnificent gardens with tall trees and flowering bushes of roses. There are gardens along the river and around the pavilions we have visited to see the paintings of great deeds inside. The main square is the second largest in the world and is where polo used to be played. 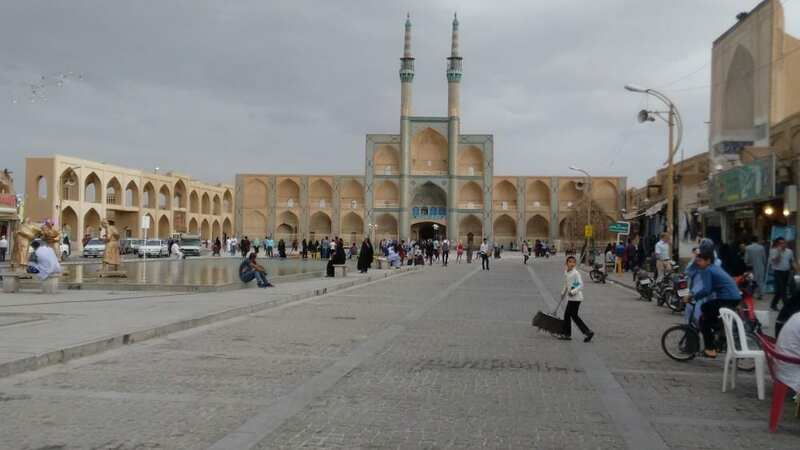 In every city there are mosques, large and small, the later ones with four iwans or huge niches, the main one facing Mecca, but the most beautiful is here in Isfahan one one side of the main square built when Elizabeth 1 was on the throne at the end of the 16th century. We leave very early tomorrow for Tehran. I shall write more when I can manage to illustrate it with photos. How wonderful that you are seeing some of the most beautiful sights on earth! We visited Isfahan in 1970 (!) and bought a carpet! How time changes the landscape! Fascinating and fantastic. I look forward to “the visuals”. MIDEAST, ITS TREASURES……AND WOULD WE GET TO DO THEM?? ALAS……JDMYERS, SF, CA.